Home | Blog | What are the deadliest drinking holidays on the road? From green beer to Irish coffee, alcoholic beverages take the spotlight on St. Patrick’s Day from morning to night. With so much drinking, we urge pedestrians and drivers to be alert and aware of their surroundings. Alcohol-related crashes resulting in death increased in Pennsylvania in 2015 from 2014, according to the Pennsylvania Department of Transportation (PennDOT)’s latest study. York and Lancaster counties carried two of the highest fatality rates by county in alcohol-related crashes, with more than 12 deaths each. To put this into perspective, only nine of Pennsylvania’s 67 counties accounted for more than 12 deaths. While holiday travel often increases the likelihood of an accident because more drivers are on the road, increases in fatality rates are often linked specifically to more impaired drivers (not just more people traveling). 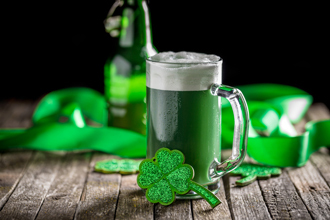 On St. Patrick’s Day, every 51 minutes, an alcohol-related car crash will claim a life in the U.S., according to the most recent data available from the National Highway Traffic Safety Administration. In fact, 32 percent of all fatalities that occur in the U.S. that day, are caused by alcohol-related crashes. Yet St. Patrick’s Day is hardly the deadliest drinking holiday on the road both nationwide and in Pennsylvania. We rank the top five deadliest drinking holidays by Pennsylvania statistics on alcohol-impaired crash fatalities. The holidays include the days immediately prior to and following the holiday (for example, Christmas includes Christmas Eve). You might be surprised to notice New Year’s did not make this list. In 2015, New Year’s resulted in 2 alcohol-related deaths. Traditionally, summer brings nearly twice the number of overall automotive deaths than during the rest of the year combined. The end of summer is just as ripe for alcohol-related crash deaths as mid-summer. In fact, the “deadliest month on the road” is August, followed by September and July. The unofficial kick-off to summer often brings an increase in travel, but also an increase in drinking and partying for teenagers and young adults. The period between Memorial Day and Labor Day has been named the “100 deadliest days” for teen drivers. Thanksgiving Eve, now referred to as Black Wednesday, has become one of the busiest nights of the year for bars. During other holidays, many people will stay in one place while drinking — whether at home, at a friend’s house or at a hotel. That’s not the case, however, when people are driving home from the bar. Whether drinking on Thanksgiving or St. Patrick’s Day, have a plan in place before you take that first sip of Guinness. Designate a friend or relative as a driver or make sure a ride-sharing app is installed on your phone. NEVER drive drunk. If you’ve been injured as a result of an alcohol-related crash, contact KBG Injury Law. We’re here 24/7 to get the Results You Deserve®.